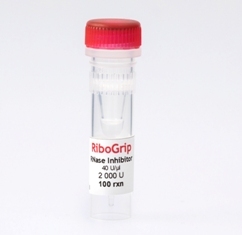 RiboGrip RNase Inhibitor is an in silico designed protein-based ribonuclease inhibitor, which inactivates RNase A. RiboGrip inhibits the activity of ribonulcease A by noncovalently binding in a noncompetitive mode at a ration 1:1. This novel inhibitor has enhanced stability at room temperature with no activity loss for up to 1 month. 06-22-01000 50 rxn 40 U/μl PDF PDF PDF 23 EUR Login to buy! 06-22-04000 200 rxn 40 U/μl PDF PDF PDF 74 EUR Login to buy! 50% glycerol (v/v), 20 mM Tris-HCl pH 7.5 at 25 ºC, 100 mM KCl, 0.1 mM EDTA, 10 mM DTT and stabilizers.